As an advancing trader, Phil Goedeker is a name that you absolutely should know. Today, Phil Goedeker is one of the premiere penny stock traders and short sellers out there. However, his success didn’t come without its fair share of ups and downs. Looking at the stories of advanced traders can help inspire new traders on their own journeys. 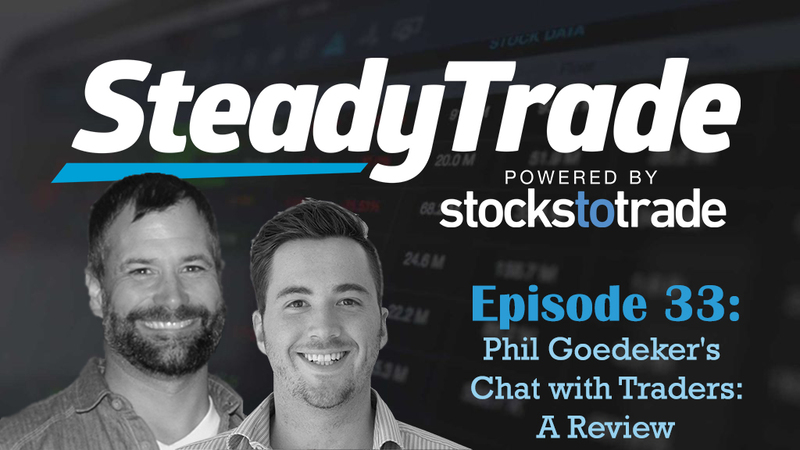 In this episode, hosts Tim Bohen and Stephen Johnson are taking inspiration from an interview with Phil Goedeker on a great podcast called Chat With Traders, hosted by Aaron Fifield. Stephen has chosen several choice clips from the interview, which he and Tim then discuss, offering wisdom that can apply to the new and aspiring trader. Clip one: what makes a good setup? Phil talks about his early struggles, and how he kept on losing money because he couldn’t find any consistency in trading. However, he was motivated to succeed so that he could have a better life, and as such, he was willing to stick with it through the losses. Steady Trade takeaways: Tim and Stephen both agree that every trader can learn from Phil’s passion for the process. Taking the long view and remembering your goals can keep you going through the sometimes challenging yet necessary cycles of losing before you begin winning. Clip two: figuring it out. Phil reveals his “aha” moment, where he began to be able to short sell in a profitable way. It wasn’t just about the money, though: he finally had an edge and was figuring out how to make trading work for him. Steady Trade takeaways: Traders, take note: it was two years in before he had that aha moment! Tim and Stephen discuss the importance of cycling through all sorts of methods before you can figure out what works for you. Clip three: getting organized. After a great winning streak, Phil began to lose again. What makes this happen, and how can it be avoided? Steady Trade takeaways: Losing big can be like a punch to the gut. As Tim and Stephen discuss, no matter how successful you have been, the market can change on a dime. They discuss how to prepare yourself for such fluctuations. Clip four: taking the long approach. Phil wasn’t necessarily a great student in school. However, as a trader, he did find motivation in looking at the long-term results, which inspired him to study diligently and gave him the ability to study patterns until he was “blue in the face”. Steady Trade takeaways: It can be easy to only look at trading day to day, but studying is important because it allows you to be a little bit more tactical rather than just being reactive to what is going on in the market right now. Tim and Stephen talk about some ways in which to remain calm and collected rather than chasing stocks. Clip five: learning from mistakes. In an effort to improve his earnings, Phil begins to shift his thinking toward diminishing his losses. What if he could determine what’s going wrong in his losing setups, and reduce mistakes? Steady Trade takeaways: “Cut losses” can be a painful or annoying prospect but it’s very important. Tim and Stephen discuss why constructive self-criticism is so vital to trading success. Clip six: have a plan. Identifying and reducing losses isn’t enough; Phil realizes that it’s important to have a plan so that trades can be more tactical. Steady Trade takeaways: The ability to be able to evaluate stocks on a case by case basis is important. Tim and Stephen talk about how thinking about entry, exit, and considering your steps can help you from pouring money into a sinking ship. Clip seven: chart your progress. Each year, Phil prints out charts he’s used and reviews what he’s done throughout the year. He keeps them handy so that he can compare one move to another. Steady Trade takeaways: As Tim and Stephen often discuss: history repeats itself fairly closely. Reviewing charts over a longer time span can be very revealing in that way. The past can inform your future! Listen to Phil (as a general life rule). Read Phil’s Year in Review. Check out Chat With Traders for Phil’s interview and more. Visit the “submit your audio” section on our website to ask questions, or offer comments. Your audio might just be featured in an upcoming episode! Another great podcast guys. The content just keeps getting better. I have a much better idea on how to track setups and how I am going to find the one setup that works for me. Thanks for another amazing podcast. If I may have a suggestion… My issue is, and I seem to not be the only one, that I am not confident enough and I second guess myself, the trade goes on without me and I was right all along. I am not even that worried about losing money but, being under the PDT, I don’t want to waste a trade. Most new traders seem to have FOMO (fear of missing out) but I have what I call FOWO (fear of wasting one). If this is something you guys can address I would really appreciate it. Patrick, have you checked out episode 25? I have listened to all the podcasts but I will review #25. Thanks Tim. Keep up the great work. I’m loving the podcasts as well as all the YouTube videos I’m watching as much of the free stuff as possible while I’m saving, for the paid for study material, from Tim Sykes and start using StocksToTrade that I think looks awesome, would I also need stt pro or would that be better after I’ve studied the other lessons? 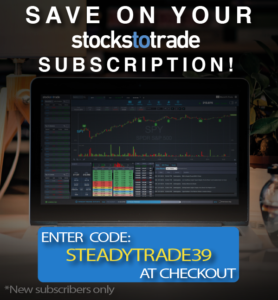 I really love the community that we’ve created, from profitly, to the trader&investor summit conferences, to stockstotrade, to steady trade podcast now, just everything everything… all in an effort to improve, help each other and continually learn. I’m so grateful for all of the information. Thank you guys! Wow thank you Nick!!! Glad that you are a listener and love your comments!! One of my happy thoughts on my trading education journey – and its a struggle learning any new profession – is that not only did Gritanni take 9 months to get consistently profitable, but he blew up twice in the process.. All your podcasts i’ve heard have been great and i look forward to circling back and listening to the rest of them. Its a journey for sure, so many lose sight of that. They see the success years down the road, but they often overlook what it took to get there. Thanks Simon! This was OK, but some past episodes needed more education and much less entertainment. KUDOS to you all! These podcasts are genius! And they’re getting better and better. So incredibly helpful! Thank you! Thank you VERY much Diane! Constant improvement is our goal! I have been listening to Chat With Traders since near its inception. It is great for anyone and even 2nd tier Newbies I suggest. One of my most favourite podcasts. They interview real & successful traders of all ages, categories and strategies. No wanna be traders, no I think I can…… Funny thing is they all basically use the same rules. And they put in many hours regardless if they have been trading for 5 years or 45 years. Many, Many make Dux, the Tims…. look like beginners as far as their brokerage account sizes from trading alone. I was just thinking, it would be awesome if you could get Aaron (@chatwithtraders) himself and make an interview with the interviewer – what he has learned and observed through his 150+ episodes, like a giant perspective from all the great treaders through one person mind. I know Aaron and have chatted with him here and there, working on it now. Keep the suggestions coming! Its a process for sure, so many overlook that.